"The nightborne of Suramar spent millennia isolated behind an arcane barrier, slowly transformed by the magic of the Nightwell. These proud, noble elves now seek to reclaim their place in Azeroth." One of the new Allied Races coming in the Battle for Azeroth expansion, the Shal'dorei were first introduced in during the Legion expansion. 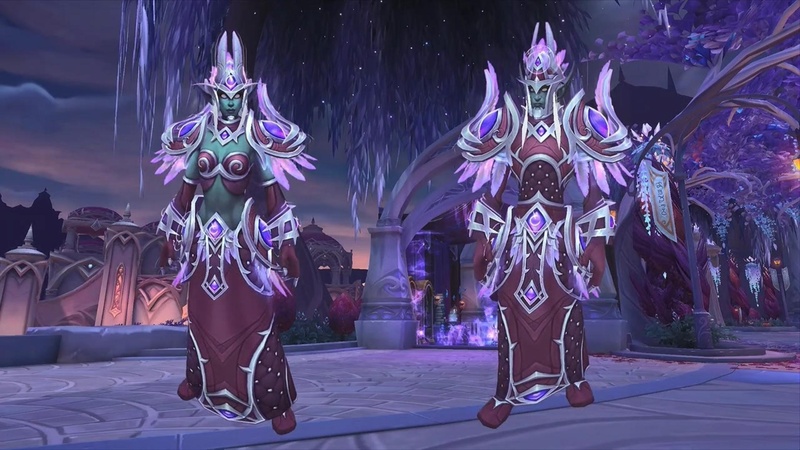 Before the Sundering, these Nightborne were the Highborne or Quel'dorei (a caste/class of noble, prosperous Kal'dorei). They have not forgotten their nobility. While there are still other Highborne spread about the world of Azeroth, these Highborne elves were changed by the Nightwell that sustained them through the bubbled years. The Highborne within the city were afraid of what wasteland might lay outside, so the shield remained active, and, consquently, these Highborne gradually became dependent upon the Nightwell (for food, for armor, for life) and evolved into a new kind of elf. They took the name "Nightborne" or "Shal'dorei". Note, Allied Races start at level 20, and with the new level scaling from 7.3.5, Nightborne can quest in any zone requiring a 10-60 level range, as long as said zone has Horde quests. Insurrection - Note: “Fight on All Fronts” is no longer required for the Insurrection campaign. an additional new quest chain, starting in the Horde Embassy in Orgrimmar. All reputation gates for the Nightfallen story will have been removed, so you can get the chains done more quickly. You must have an existing character of at least level 110 on a realm to create an Allied Race character. Capital: The Nighthold, Suramar (non-instanced version) This mini-hub mini-capital has portals to Dalaran, Orgrimmar, and Shal'Aran! The Nightborne crest includes The Dusk Lily, which was used as the symbol of the resistance during Elisande's rule. "Respect magic, or it will break you." Racials: Nightborne racials are Arcane-oriented. Cantrips Cantrips - Conjure up an Eldritch Grimoire, allowing you mail access for 1.5 minutes. Arcane Pulse Force Shield - Enchants an area with arcane energy, damaging and snaring nearby enemies.? Dispell Illusions - Draw upon your arcane sight, piercing illusions and invisibility within 15 yards. Masquerade - Shroud yourself in illusion, taking on the appearance of another Nightborne. Ancient History Ancient History - Inscription skill increased by 15. Magical Affinity Magical Afifnity - Increases magical damage 1%. Arcane Resistance Arcane Resistance - Reduces Arcane damage taken by 1%. Female Physique similar to Night Elves. Fit and muscled, yet lean. Males have very narrow hips and a sort of swimmer's physique (currently either their arms are shockingly long, or their thighs seem a bit short). Very tall Elves. Taller even than Night Elves. Long ears like Night elves, but with upwardly-pointed curvature and upward-facing tips. Male ears are situated closer to the head than female ears are. Hair colors in variations of white and black. Skin colors in variations of blue-tinted tanish-grey and greyish-blue. Highly adept at Arcane magic. Where the Night Elves cast aside Arcane magic after the Sundering, the Nightborne embraced it and utilize it in every aspect of life. Sensitve to illusions, stealth, and tricks. Intelligent, honorable, noble, and cultured, they value knowledge and magical prowess. Often arrogant, disdainful, or pompous, they value status, blood relations, reputation, beauty and royalty/nobility (to be expected, as these were the Highborne pre-Sundering). When an Allied Race character is leveled from 20 to 110 (sans boost), the player gets Heritage of the Nightborne, an achievement that unlocks a set of Heritage armor to use on that race for their account. Lady Nightborne in the Heritage gear in the wowhead Dressing Room! Your body must be a font of magic, because I'm irresistibly drawn to it. You must know magic too, because you just made everyone else in the room disappear. You've found the Arcway to my heart. Mmmm, I wanna tap that ley line. I think I've night-fallen for you. I've got a feeling we were night-born for each other. The stars have judged you, and found you... smokin' hot. Were you picked from the Arcan'dor? Because you're the apple of my eye. To be honest, most of the time something was quite right. Why does everyone keep asking me to say that? Ughhhhh. Fine. An Illusion. What are you hiding. My name is Roy, and I'm a mana addict. It's what I do. I drink arcwine... and I know things. Back in my day, there was only one kind of elf. ONE. I don't know why they call it the Court of Stars. I hang out there all the time and I never see anyone famous. Let's be honest. Keeping a giant, angry dinosaur caged up in a zoo was bound to end badly. Is that an illusion in your pocket, or are you just happy to see me? No illusions here. Everything you see is real... very real. My Nightwell brings all the boys to the yard. Animate? Detonate? I suggest we skip straight to replicate. I'll show you my ley lines if you show me yours. I've been trapped in a bubble with the same guys for 10,000 years. You could say I'm ready for a little... variety. There's no area denial in this raid. An allusion! What are you implying? Roses are red, our city is fair. Is that a disguise? WHO GOES THERE? Care for a glass of arcwine? I jumped on the berries myself. Tyrande still looks good after all these years. Know if she's seeing anyone? I met this kal'dorei who told me my dress was the pinnacle of fashion... 10,000 years ago. Ouch! Those night elves really know how to throw shade! Night elves? More like country elves! They live in trees, sleep in dens... sometimes even grow antlers. They're not cut out for life in a REAL city. You really must attend one of our parties in the Court of Stars. I've never met anyone more in need of a mask. Maybe you want a different Nightborne mount? Leywoven Flying Carpet - chance to drop from The Nightfallen Paragon cache after exalted. Mystic Runesaber - store mount, $25 on the site or in-game. Maybe you're looking for an Arcane battle pet? As of yesterday : no idle animation while standing, and no flip while jumping either. Oddly enough as well, but when going into Suramar City as a Nightborne, I need to put on a masquerade mask to look like, none other than a Nightborne, in order for the locals to be neutral to me. ? I have to basically look like I do. . . I'm thinking someone didn't really think that through. Something I just noticed, when I mount my Arcanist's Manasaber, I automatically put on the masquerade mask. I've not tried it with any other mount. . . yet. Ok, just tried it with the Nightborne Manasaber, the Grand Expedition Yak and the Azure Water Strider, the only mount that put the masquerade on when I mounted was the Arcanist's Manasaber. Pretty cool. Nightborne intro: For ten-thousand years, Suramar was the only world we knew. As the ages passed, Azeroth changed around us... and fell into the Legion's grasp. To secure our people's future, you must help reclaim our place in Azeroth. Venture forth alongside new allies and show the world that the legacy of then Nighborne is one nobility... and strength. Nightborne intro (narrated by First Arcanist Thalyssra): For ten-thousand years, Suramar was the only world we knew. As the ages passed, Azeroth changed around us... and fell into the Legion's grasp. To secure our people's future, you must help reclaim our place in Azeroth. Venture forth alongside new allies and show the world that the legacy of then Nighborne is one nobility... and strength. Ironically, "...and repay our debt to the people of Azeroth" apparently turned out to mean jump under weak reasoning into one of the warring factions and get embroiled in a bloody war with another faction, which so to say equally helped Nightborne to purge legion from their home. So really it's just "repay debt to half the people of Azeroth and stab in the back another half for their help in hard times". Either really poor writing post Suramar questline (since it's way too out of character for Thallysra to do something like this), or poor writing in Suramar campaign that portrayed Thallysra as a positive character. Either way Nightborne ended up gladly accepting help from both Alliance and Horde and not complaining about numberless times alliance heroes (as well as horde heroes) saved said Thallysras skin from withering, which was easily forgotten and in the end turned their backs on Alliance. When will their tattoos get fixed in the dressing room? A quick mention about getting these guys via alliance: you can't. Make absolutely sure you do this questline on a horde 110 to avoid trouble. Otherwise youll need to faction change and race change. Ideally you dont have to do that if you look since the information is relatively hard to find otherwise. I'd hope that at some point this is more obvious via in game ui or something else that may assist in the knowing of such. If you have completed Insurrection and are exalted with the The Nightfallen but don't see a quest in the embassy. You have to acquire the additional achievement Welcome to Zandalar before the quest Thalyssra's Estate becomes visible. The need to have a 110 character on a realm in order to create an Allied Race only applies to trying to create a Kul Tiran or a Zandalari, you can create any of the other allied races without having a 110 character on that realm. I've created Lightforged, Void Elf and Nightborned alts on realms that had no 110 characters.